The use of stretch fabrics in freeform or with a structure, allows the creation of cutting-edge concepts that push the limits of imagination. Innovative and spectacular style and design. Sleek and beautiful lines. always well-drawn finish, no wrinkle marks. Lightweight and compact, easy to transport, store and install. Great savings on indirect costs. Fire retardant treatment for all textiles to international standards. High resolution and color depth that is resistant to washing and wear. washable and easy maintenance. Our unique modular structure system is one of the most lightweight and robust on the market. A single Allen key (supplied) is required to assemble most of the solutions we produce; regardless of your project’s size, you or your client will always have a very simple system to assemble. Strong, lightweight and compact aluminum frame. Satin anodized finish for a high quality finish. Wide choice of stretchable fabrics, textures and colors. We offer a comprehensive range of textiles, chosen depending of the requirements necessary of each project. You have a project coming out of the ordinary? We will find the right textile for you. Some projects do not require printing, then solid color textiles are a simple and economical solution. 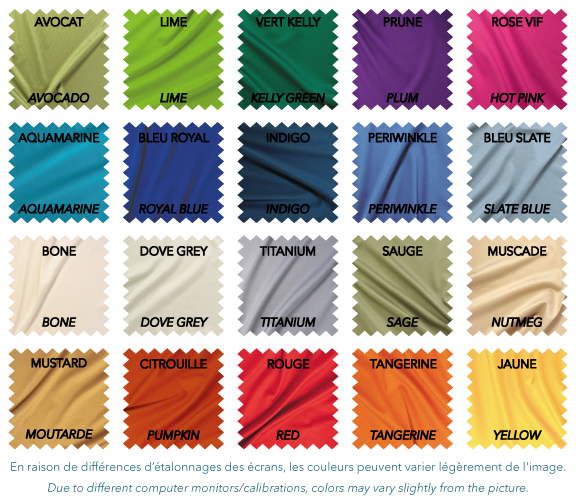 Textiles are available in many colors and finishes, including the mesh (net, tulle). Our dye-sublimation printing services also allow you to customize our products to your image. Our textiles are printable in HD through dye-sublimation. The printing process incorporates the image in the textile fiber for a perfect result. The impression does not fade with time. Unlike screen printing, printing will not crackle once stretched. For maximum impact and impeccable product, quality printing is a necessity. The print service that we offer reaches the highest standards. We can print up to 120 inches wide with some fabrics and 102 '' with the others. In the case of wide-scale projects, joints and seams are virtually undetectable. We are uncompromising in regard with fire safety and all our textiles have received fire retardant treatment with approved products to the strictest standards in Canada, the United States and Europe (NFPA701 small-scale, CAN UL-C109, M1, B1, etc. ).